RWBY begins tomorrow everyone. This is probably the most anticipated volume outside of the first volume. So what's been happening? Well, Team JNPR is now released to Grimm Eclipse. As I said in my earlier post, they're 4.99. Each one brings new abilities to the table. I haven't had a chance to try them out, but when I do, I'll add them here. 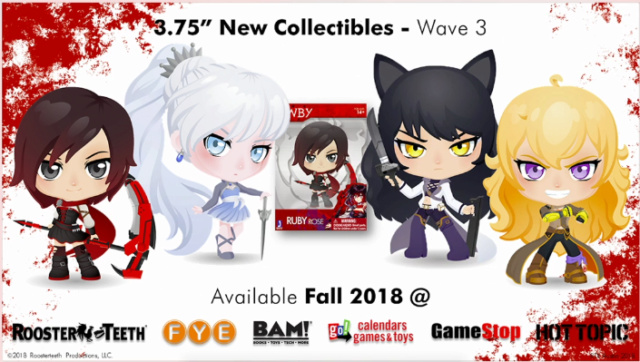 The Vinyl figurines, poster and the calendar that were shown at RTX and New York Comic Con have been released to the store, along with Blake's Figure Doll, the Volume 3 physical CD (the artwork is stunningly beautiful), a hat, a shirt, Chibi buttons, and four posters designed by a RWBY fan and inspired by the events of Vol. 3. Also, the Steelbook for RWBY Vol. 1 thru 3 is up on the site. Also, a video recapping Volume 1 through 3 was posted at the start of the week. Check it out here if you want a nice refresher. And if you haven't seen it already, watch the Volume 4 character short here. Along with the video, four World of Remnant videos were posted, all of them focused on the four kingdoms of Remnant, all voiced by Qrow Branwen. Also, I'm going to place up a reminder for how videos are posted on Rooster Teeth. First Members - Day of. Site Members - Day after. So that's all for now. Here's to a good Volume! RWBY fans^ So I'm assuming Rooster Teeth members have seen Ep. 1? Why they have to mess up my girl Cinder up so bad Everybody's new looks are great, especially Jaune's, anyone notice how he has a red sash around his hip like Pyrrha did? New set of antagonists to look forward to. Ty for putting that in the spoiler, most of us have seen ep 1. One person is barely started season 3. Episode 2 of Vol 4 is up for free members today! Just make a free account on RoosterTeeth. Not sure how I feel about Whitley, and Ironwood has definitely seen better days. As for Papa Schnee... Not a fan. Jaune in the woods broke my heart, but it was nice to hear more from my favorite character, even if it was just a recording. Managed to watch Episode 3 before I headed off to sleep last night. We get to see how both Blake and Yang are doing, Sun tags along with Blake, as a stowaway on a boat (again), he also makes a Journey to the East reference. There's motherfrigging dragon. Ends off with a nice interaction between Salem and Cinder. Volume 4 is a joy to watch. Each episode gets better and better. The Season Finale was spectacular, and I really hope they release the soundtrack in May, which seems to be their norm. Hello all! Here to present news of RWBY from their RTX panel. 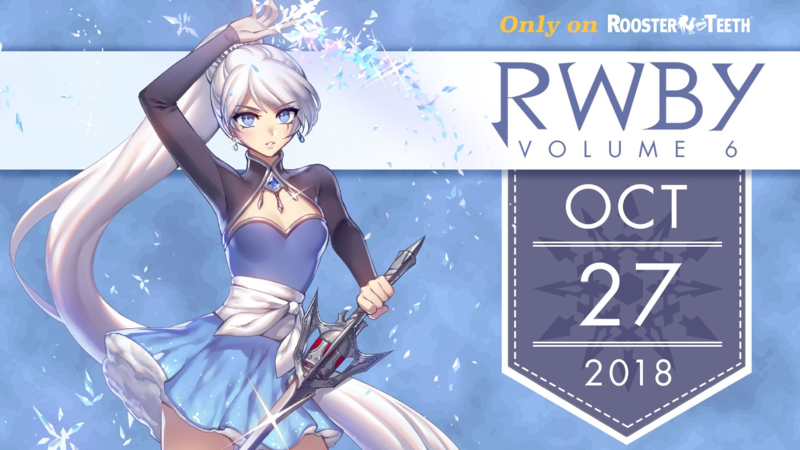 First off, RWBY is premiering October 27th for First Members. Just like with last volume, the team is having a volume premiere through Fanthom events. If it's anything like the one I went to for the premiere of Volume 5, they'll play the last three episodes of Volume 5 with behind the scenes discussion from Miles, Kerry, and Gray, and then show the Volume 6 episode. The website says tickets will be made public on August 17th. This could change, though. They're also only releasing one character short this volume. The short centers on Adam, and from what I've gathered from the chat room and Twitter, it features more of the White Fang and Sienna Khan. No mention on when this short will be released, but it's going to be anytime between now and October 25th. Update: The video was released on August 17th. Check it out here. 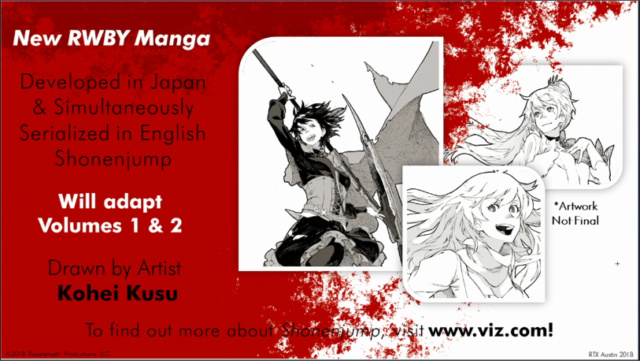 At the panel, they reminded the crowd that RWBY does have a manga series, with the Weiss manga coming out this month. But that's not all the manga news. There's a new manga coming out that will cover Volumes 1 & 2. 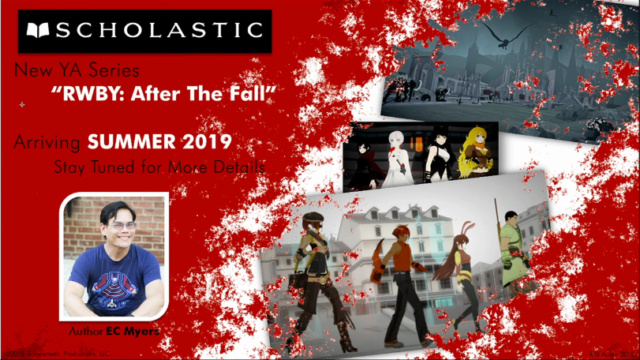 On top of that, a Young Adults book will be released through Scholastic that will focus primarily on Team CFVY and what they're up to after the Fall of Beacon. It will be dropping in Summer of 2019. Onto merchandising. There's quite a few dropping. No new poster, yet. But there's plenty of toys if you have some empty shelves that need some love. Team RWBY has been updated to reflect their Volume 4 designs, including Yang's new arm. Mini figures have also been updated to reflect Volume 4 designs, and Qrow, Oscar, Raven, and Cinder have been added (no Prryha, though). 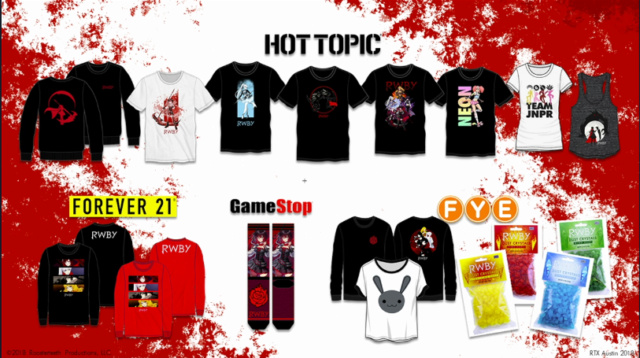 But Rooster Teeth isn't selling just toys. They've got a new calendar for 2019 (I'm probably the only one who cares about this one). 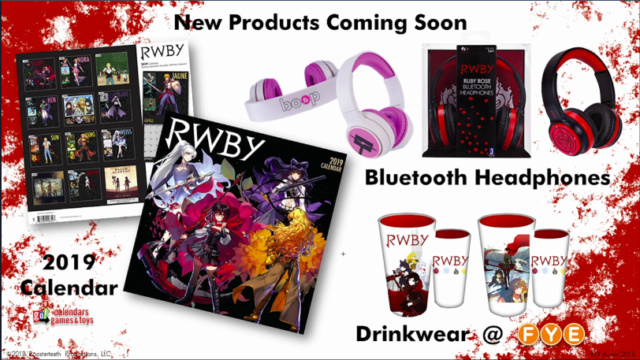 Two new Bluetooth headphones: Ruby styled and Nora styled. Some tumblers too. A lot of shirts are being sold in stores too. And to go along with the fact that they have a cereal (I need to find an FYE to get my hands on it), they're making Dust Crystals colored in the girls' colors. On a side note: They're selling to Forever 21, but I still won't shop there. Not even for RWBY. In cool news: Rock Band has a RWBY song. "This Will Be the Day" can be played in Rock Band, and two more songs are to be added later on. No word on which ones these are, but I'd harbor a guess that it's most likely "Red Like Roses II" and "Ignite". More content is being done to Grimm Eclipse. They say it's a content update, and I believe this includes graphics. It's releasing in the Fall. If you own the product before this time, the update is free, and features new horde mode maps, campaign mode and new game mode. There will be more DLCs. 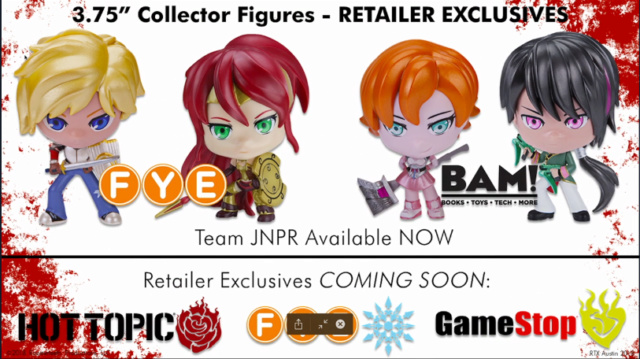 The two mentioned are pj sets for Team RWBY and JNPR (including unseen pjs for Pyrrha and Ren), as well as Volume 4 looks (if this includes Pyrrha wasn't stated). They will add more information later. This is all that was released from the panel. There are two more panels for the show, one on Saturday and the other on Sunday, but they don't typically reveal new information that wasn't already released at the first panel. I will be keeping an eye out on their Twitter to see what new information they might let out. BUCKLE UP EVERYBODY! RWBY HAS ARRIVED! That's right! RWBY Volume 6 has begun. Well okay, it began October 27th, but give me a break; I was busy. I'll be using this post to place up the schedule of each episode, as well as a link to them. I'll be posting the schedule for FIRST members in bold, and the general members in normal font. NOTE: If you want to talk about the episodes, please use the spoiler tab. In other news, RWBY and Rooster Teeth's new series Gen:Lock are getting their own comic books series from comic book powerhouse DC. Both will be released in 2019, but when exactly hasn't been pegged down. It is assumed, so far, that the comic book series will be non-canon to the show, much like the manga series, but that is only speculation. Also, their Young Adult book from Scholastics, After the Fall, has revealed its cover and is up for pre-order. It will be released July 9th, 2019. It will follow the adventures of Team CFVY at Shade Academy after the Fall of Beacon. RWBY: Official Manga Anthology, Vol. 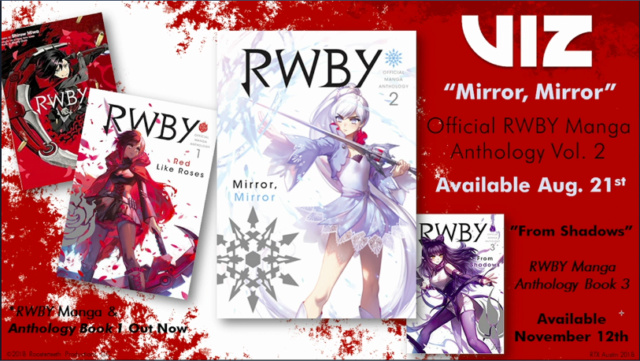 3: From Shadows will be releasing November 22nd, and RWBY: Official Manga Anthology, Vol. 4: Burn will be releasing February 19th, 2019. 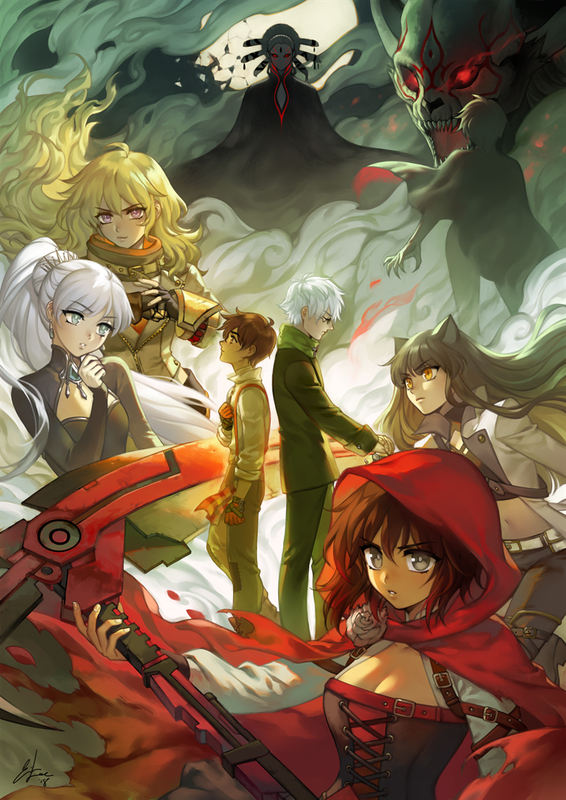 Both manga series follow a particular RWBY girl, with From Shadows focusing on Blake and Burn focusing on Yang. No word on the new manga series.